BRUSSELS (Reuters) - Brazil and the European Union agreed on Monday to lay an undersea communications cable from Lisbon to Fortaleza to reduce Brazil's reliance on the United States after Washington spied on Brasilia. At a summit in Brussels, Brazilian President Dilma Rousseff said the $185 million cable project was central to "guarantee the neutrality" of the Internet, signaling her desire to shield Brazil's Internet traffic from U.S. surveillance. "We have to respect privacy, human rights and the sovereignty of nations. We don't want businesses to be spied upon," Rousseff told a joint news conference with the presidents of the European Commission and the European Council. "The Internet is one of the best things man has ever invented. So we agreed for the need to guarantee ... the neutrality of the network, a democratic area where we can protect freedom of expression," Rousseff said. EU leaders are sympathetic to Brazil's call following the revelations of fugitive former NSA contractor Edward Snowden that showed the agency also eavesdropped on German Chancellor Angela Merkel's mobile phone and some EU institutions. Brussels is threatening the suspension of EU-U.S. agreements for data transfers unless Washington increases guarantees for the protection of EU citizens' data. At the one-day summit, there was no public criticism of the United States, which remains the European Union's closest ally. But Rousseff clearly took heart from Merkel's calls this month for a European Internet that is protected from U.S. surveillance, even if there are questions about the practicalities of setting up alternative networks in Europe. 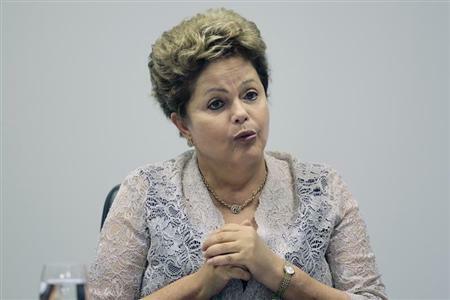 Rousseff said Brazil and the European Union have "similar concerns" about U.S. dominance of fiber-optic cables and hoped to have a cable running from the Portuguese capital Lisbon to the northeastern Brazilian of Fortaleza from next year. Under current plans, a joint venture between Brazilian telecoms provider Telebras and Spain's IslaLink Submarine Cables would lay the communications link. Telebras would have a 35 percent stake, IslaLink would have a 45 percent interest and European and Brazilian pension funds could put up the remainder. With talks between the EU and the South American trade bloc Mercosur dependent on Argentina's willingness to come to the negotiating table, Rousseff initially cancelled her trip to Brussels because she expected to have little to discuss. The latest date will be decided after a technical meeting of negotiators on March 21, European Commission President Jose Manuel Barroso said, who said offers could then be swapped at some time "in the foreseeable future". 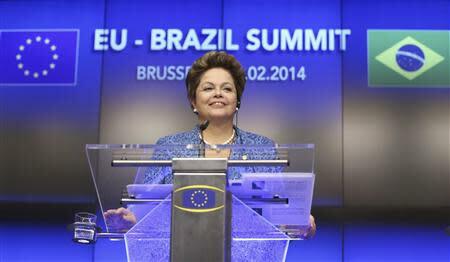 Brazil, one of the world's largest and most influential emerging economies, is ready to do a deal. It is backed by Uruguay and Paraguay but the question is whether Argentina, one of the most protectionist members of the Group of 20 countries, will join in opening its economy to greater EU imports.